Yesterday was a bit of a sucky day so to cheer myself up, I decided to participate in the Weekly Bake Off which I discovered by Twitter. In a nutshell, the lovely @WeeklyBakeoff decided to bake her way through Mary Berry's 100 Cakes and Bakes and has invited her fellow tweeps to participate. Every Monday, she selects a recipe. People bake it and submit their pictures by the following Sunday for a bit of fun judging. It sounds a little bit odd as the judge only gets to see the cakes and not actually taste them. In fact, I was a guest judge for the Black Forest Gateau and it was really hard. Firstly because they all looked great, but secondly because you have to look beyond the skill of the photographer and judge things like the balance of cake to filling and factor in any unusual twists in decoration. There were only four entries the week I judged as it was the week before Christmas and it took me ages to make up my mind. I pity whoever is judging now everyone's back to normal baking. So on to the actual bake. It was an interesting recipe. 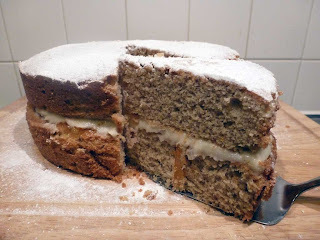 When I first read it I decided not to try it as I'm not really a fan of orange or Victoria sponge, but I needed some baking therapy and a second perusal showed it to be a really really simple operation that I could perform whilst Miss A ate her tea. You literally chuck everything into a bowl and mix it for two minutes on high before putting into prepared tins, baking it, making the buttercream filling whilst it's cooking, then it's just a case of cooling, filling and dredging with icing sugar. Mine took more than the five minutes the instructions implied. The recipe uses light muscovado and I'd let mine get damp so I spent ages trying to beat and grate it back into some semblance of sugar grains. I then chose to beat it with the butter first to make sure that it was a smooth as possible. I also increased the quantities because Berry uses a smaller tin for this cake, but helpfully, her standard Vicky is in a 20cm tin so I stole the ratios from there instead. It made a lovely soft cake mixture and the muscovado meant it was less sweet than a regular white sponge. It baked really well - especially given my trouble on Friday and the general issues I've been having with my new cooker. One rather stupid schoolgirl error was that I forgot to butter the tins so the edges are a bit raggedy - but I think it adds to the farmhouse charm of the cake. If you don't have hardened sugar, it really is simplicity in itself to make, bake and fill. I've yet to do a taste test of an actual piece as I'm taking it in to work tomorrow. Having tried the components though, it's looking good for a non-orange cake, non-Vicky eater such as myself. The bitterness of the marmalade works really well against the sticky-sweet buttercream. For the record, I used Waitrose Essentials Seville Orange Marmalade which I love. It's so cheap compared to other Seville marmalades which is great when you have to watch the pennies. Was hoping to get some Sevilles to try my hand at marmalade making, but I fear I've missed the boat this year. Although I understand you can buy pre-prepared oranges from Lakeland. But that's just a bit cheaty isn't it? In the spirit of the Bake Off, I am following the lead and not publishing the recipe. The book is only £4 or so on Amazon and is definitely worth a buy, even if you don't want to join the competition. However, as I'm in a sharing mood, I will share with you my mum's Vicky Sponge recipe which she drilled in to me as a child. I can't remember exactly how old I was when I learned this recipe but it's one of those things I'll never forget. The chocolate version characterises my childhood and always reminds me of the Michael Rosen poem 'Chocolate Cake'. Rosen is probably best known as the illustrator of Roald Dahl books in the Eighties but wrote and illustrated many books and poems of his own. If you love cake and have never heard this poem, go read it now! Beat the margerine, sugar and vanilla essence until light and fluffy. Sift the flour into the bowl and mix gently until well combined. Divide between the two sandwich tin. Wet your hand and use it to smooth the batter evenly around the tin. Make a well in the middle of each tin, exposing the tin base. This will ensure you don't get a bump in the middle of your cake. Bake for 25 minutes before turning out on to a wire rack to cool. To make this a chocolate cake, replace 1oz (25g) of the flour with the same amount of sifted cocoa powder. Beat together the icing sugar, margarine or butter and vanilla essence until smooth and creamy. You may need to add a splash of milk if it's too dry. Use the jam (if using) and buttercream to sandwich the cooled cake.